The night of February 27, 1933 loomed dark and gray over the city of Berlin. The Reichstag, seat of parliamentary government in Germany had been in recess since December of the preceding year. New elections were scheduled for March 5th. The great building was quiet and except for a watchman, empty. At 9:05 that evening, a student passing by saw a man carrying a burning torch through the windows of the first floor but did not report it. Ten minutes later smoke was observed coming from the building and the first fire alarm was received by the Berlin Fire station. In less than ten minutes the firemen were on the scene but already flames were breaking out all over the building. At 9:30 there was a tremendous explosion and the great central chamber was totally enveloped in flames. The fire quickly raced out of control despite the efforts of the fire fighters and soon only the walls of the gutted building were still standing. Within minutes police arrested a half naked and seemingly dazed Dutchman, Marinus van der Lubbe, who was discovered at the scene. It wasn't long before Chancellor Hitler and Prussian Minister Göring arrived amid a flurry of reporters and photographers. Although he had just stepped out of his car, Göring at once accused the communists of setting the fire. The debate over who set the fire continues and may never be solved to everyone's satisfaction. Despite attempts to support the case against van der Lubbe, who was tried and executed for the crime, a great deal of evidence collected and analyzed by Walther Hofer of Bern points in the direction of a SA/SS Sondergruppe headed by Reinhard Heydrich and an official of the Prussian Ministry of the Interior, Kurt Dalüge. Less important than the cause of the fire however was the result. Before the sun rose on the morning of the 28th, over 4,000 communists and a miscellany of intellectuals and professional men who had incurred the wrath of the Nazi Party were arrested. A shaken President Hindenburg, 86 years old, was easily convinced that the nation was on the verge of a communist revolution, was induced by Hitler to sign an emergency decree suspending the basic rights of the citizens for the duration of the emergency. This decree also authorized the Reich government to assume full powers in any federal state whose government proved unable to restore public order, ordered death or imprisonment for a number of crimes including some newly invented such as resistance to the decree itself. The decree did not include any provision guaranteeing an arrested person a quick hearing, access to legal counsel, or redress for false arrest. Those arrested often found their detention extended indefinitely without legal proceedings of any kind. On March 2, Hitler was asked by a corespondent of the Daily Express whether the suspension of liberties was permanent. He answered in the negative saying that full rights would be restored as soon as the Communist danger was over. The reality was that the decree of February 28th established what would become the normal order of things under National Socialism - arrest on suspicion, imprisonment without trial, the horrors of the concentration camps. This condition would persist until the end of the Third Reich. Immediately after its promulgation the decree was turned against the real and fancied enemies of the Nazi Party. In the last weeks of the election campaign the Marxist press was silenced. The Social Democrats found it impossible to campaign effectively and even respected Center party politicians like former Reich Chancellor Heinrich Bruning had their meetings broken up by brownshirted SA thugs. Despite this the Nazi Party fell far short of the two thirds majority needed to change the constitution. Hitler now showed his contempt for the rule of law by turning the decree of February 28th against those states where significant opposition still existed. Using the argument that local authorities were unable to maintain order, which was in the main being disrupted by drunken brownshirts and SS members, the government replaced the legally constituted governments of Wurttemburg, Baden, Bremen, Hamburg, Lubeck, Saxony, Hessen and Bavaria. Soon, with the support of the Center, Catholic and Bavarian Peoples Parties, the Nazis gained the passage of the Enabling Act, and Adolf Hitler on the afternoon of March 23rd, became the supreme dictator of Germany, free from any restraint from his cabinet or the aged President Hindenburg and free to mold Germany into the nightmare state of his darkest dreams. 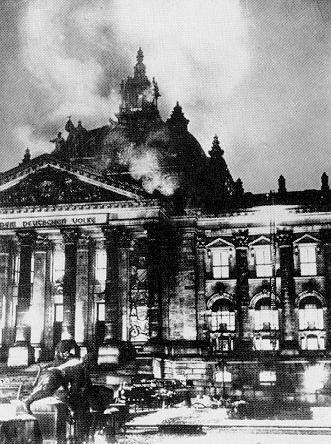 While it is not clear whether the Nazis intentionally set the Reichstag fire in order to create a national crisis, or whether the Nazis simply were opportunistic, the event was used as justification for a sharp curtailment in constitutionally guaranteed civil liberties. The Nazis took advantage of the additional Federal police powers to suppress opponents. It is clear that in other situations, the Nazis did use the tactic of creating a "law and order" crisis so that they could provide a solution which further eroded civil liberties and entrenched their power. The right-wing Nazis and the left-wing communists were cut from the same cloth -- the point is not that the far right destroyed civil rights. Rather, the point is that a democracy can be destroyed by creating a law-and-order crisis and offering as a 'solution' the abdication of civil liberties and state's rights to a powerful but unaccountable central authority.